short snippets: PACKED TO THE RAFTERS. 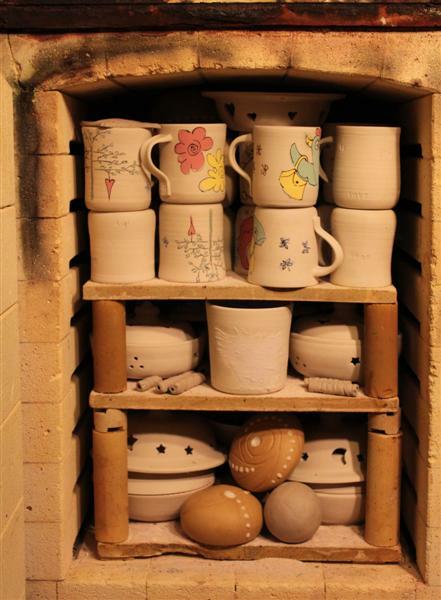 Another load ready to be fired, a fully loaded kiln. In this load I have pieces that need to be fired once more with glaze added on them then fired at a higher temperature, and some that only need one fire in the electric kiln and then another firing in the raku kiln, still there are again other pieces in here that need a firing to only a low temperature, so a real mixture of different clays, firings and glaze application. Why am I doing this again?? Just to keep it interesting and keeping me on my toes! Waiting to go in the next firing together with the low fire glazed pieces. These need only one firing in the electric and then in the raku kiln. 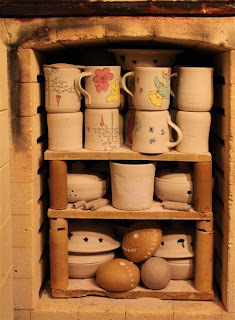 And with all the different firings I want to try new glazes just about every time I fire, again to keep it interesting!! Little pots of trial glaze to see if I like it, and then make larger quantities. And so.....I end up with these little pots of glazes which I will use again some time later. Memories! Nice to see such a variety of work Mieke... and making your own glazes too. My pottery was never as neat... and is worse now with the collage 'makings' all over the place. Good luck with the final firings. I have to admit that I am glad I am not a potter- so much clay and glazes and work and effort! but you have beautiful results too.